Cut the Rope: Experiments is a sort of sequel to Cut the Rope. You begin each level with a piece of candy attached to a point by a rope and most of the puzzles have you cutting that rope at some point. You then need to collect stars and get the candy into the mouth of the creature. This is a fun game with a lot more strategy than you might expect from the simple explanation. 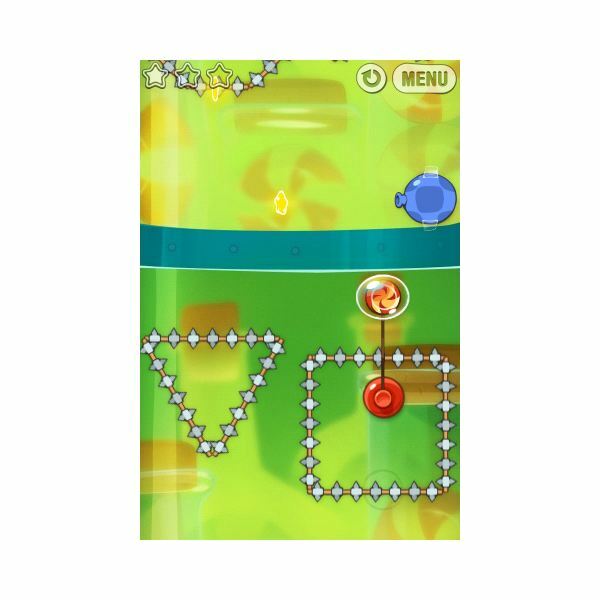 Each level feels very different with some focusing on bubbles that cause the candy to float, spikes that can destroy the candy or simply timing tricks. And with 75 levels and three stars to try to gather in each level there is a lot of room to explore and experiment with this game. There are a few big additions in Cut the Rope: Experiments. These include locations that have the ability to shoot out ropes to attach to the candy and suction cups that hold the candy in place with ropes. These can be connected and disconnected from the wall to allow you more control. The major advantage of both of these is that they tend to be far less linear than the elements in the previous game. This really does give the player a lot more room to experiment with how they want to solve puzzles than in earlier games. There is still a single solution in many levels, but finding it is much more fun when you have flexible tools. They also simply give the level designers a lot of new options for creating fun levels. These additions are not without their weaknesses, though. The major problem with both of them is that they tend to be more sensitive to timing than the other tools. With the ropes this is minor, since they don’t need to be aimed. The suction cups are harder though, because you actually have to tap the cup in order to stick it to the wall. This means that when it is swinging around the level it can be really hard to get it to stay where you want. In some of the more difficult levels it can mean replaying the level a number of times. Still, while this can cause some frustration, it is mostly because of the flexibility, which is generally a good thing. The game looks very similar to the original Cut the Rope. The additions to this game look excellent and yet they are able to preserve the same tone and sense of humor. 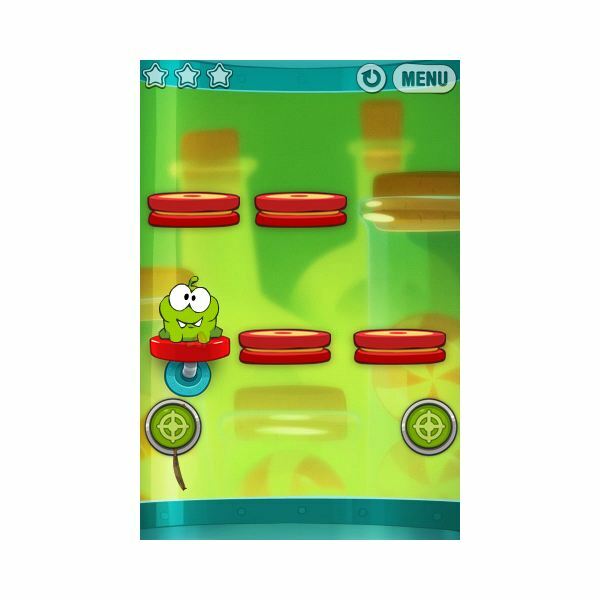 The levels are bright and fun and the movement of the creature as he tries to grab the candy gives him a lot of personality. The new elements that were added look very good. The small plungers connecting the ropes when they strike and the marks where the suction cups were attached both add a level of realism and help to make it clear what is going to happen. The music itself is simple and generally unobtrusive but it can become a bit repetitive. Better than this — the sound effects are excellent. The most notable of these effects is the voice of the professor which sounds like the classic cartoon professor and chimes in just often enough that it doesn’t feel repetitive. Nearly everything that you do in Cut the Rope is very clean and instinctual. To cut a rope you only need to slide your finger across that rope. This allows you to easily cut multiple ropes in a single slice. Everything in the game is that simple. Shooting the ropes from the new targets simply requires you to touch it. To control a suction cup you only have to tap the suction cup. Even breaking the bubble only requires you to touch it. These simple controls are one of the reasons this game is so much fun and so easy to recommend. Whether you have already done everything in Cut the Rope and you are looking for a new challenge or you have never played the game and you are simply looking for a good action puzzle game — you will enjoy “Cut the Rope: Experiments”. This is a game which has an extremely simple core idea, but with developers who have found ways to stretch out that experience so there are hours of enjoyment to be found in this game. This makes it an excellent game app for both expert gamers and more casual gamers. Images, screen captures author’s iPhone.